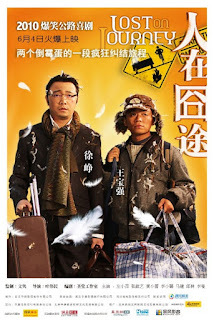 Lost on Journey is one of my favorite comedies from mainland China. This movie gives you an amusing view of social issues in China and reflects the many common complicated problems that occur in this densely populated society. 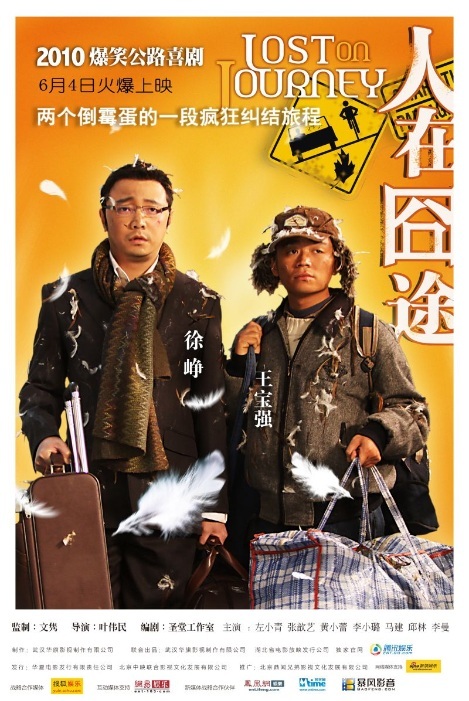 This movie is mainly about a milk extraction technician, Niu Geng (played by王寶強), who is on a trip to Changsha to ask his employer for back pay, and a business man called Li Cheng-gong (played by 徐崢), who is on his way home to the same city for the Spring Festival celebration and family gathering. The movie consists of their dialogue and how a series of troubles hinder their ridiculous journey. There are many interesting and thought-provoking points and details I want to share with you. To begin, Niu Geng is unclear about the regulations that airplane passengers should follow since this is his first journey by air. He gets angry because he is forbidden to carry milk on the airplane; therefore, he swills down the entire bucket of milk he had brought for his trip. When he starts to feel like vomiting during the flight, he asks the stewardess to open the window and let some fresh air in so that he could feel better. Haha! How naive and funny this migrant worker is! Later on their trip, Niu convinces Li to buy a lottery ticket. To their amazement, they win first prize, which is a car! So, they decide to drive this car to Changsha. Suffering from lack of sleep, Li decides to let Niu drive for a while. Niu falls asleep and drives the car into a ditch. The two frantically pull themselves out of the car in anticipation of an explosion as they often see in movies. Nothing happens, but the car still cannot be driven and they have to spend the night in the middle of nowhere. In this adventure, Li Cheng-gong is definitely a man out of luck. The flight, and the train and bus rides drive him mad. That was just the beginning of the trouble that awaits him and Niu. Later, while they are having a barbecue on New Year’s eve, Li told Niu his story and admitted that he was useless. He had spared little time to help his daughter with her studies, he had started a relationship with a mistress while he still loved his wife, and he had treated his employees badly. I think that’s why the director made so much trouble happen to this guy. This movie offers you a closer look into Chinese society. Firstly, Spring Festival transportation is a serious problem that the Chinese government has tried to solve. Laborers want to return home and see their families during the Spring Festival, and the resulting crowds of people moving around China at New Year has been said to be the largest annual human migration in the world. The railway network is insufficient to handle the number of passengers, and many social problems result. Moral issues are also addressed in this movie. When they are about to get on the bus from Wuhan to Changsha, Niu is very sympathetic to a beggar begging money for medical treatment for her daughter. Niu wants to give her some money, but Li thinks she is a swindler and discouraged Niu from doing so. On the other hand, Li was very impressed by Niu’s kindness and thought he was naive and silly. It turns out that Li is right – that the daughter wasn’t really sick. Truth be told, such phenomena are common in China and people in China are confused about how to cope with seemingly pitiful beggars. Lost on Journey is an accurate portrayal of modern China; it shows both positive and negative sides of this complex society. What makes this movie so successful is that it uses humor and entertainment to give us a real sense of modern China.